At the Dscoop EMEA conference at Lyon, Highcon revealed a major productivity boost for the Highcon Euclid that increases the effective speed of the digital cutting and creasing machine by up to 40% for a B2 sheet size. YAVNE, Israel — June 7, 2017 — Just one year after drupa, Highcon has selected the Dscoop EMEA conference at Lyon to launch a major productivity boost for the Highcon Euclid. The newly introduced capability dramatically increases the effective speed of the Highcon Euclid digital cutting and creasing machines by up to 40% for a B2 sheet size, reaching speeds of up to 2,750 sheets per hour. 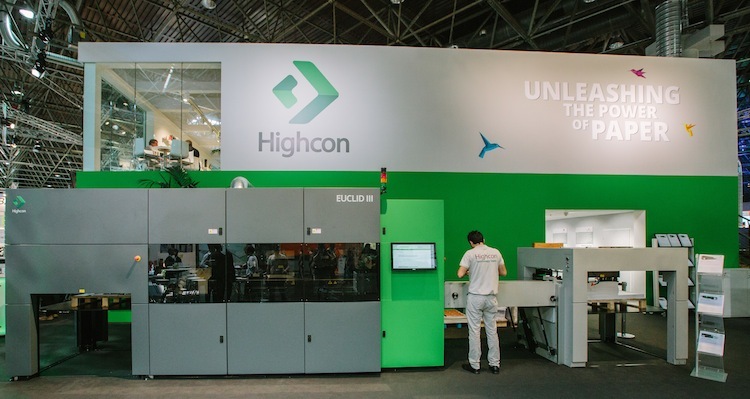 Highcon customers have already proven the productivity of the new boost function on their Highcon Euclid machines, which allows them to perform more jobs on the machine per day, with increased profitability. The HP Digital Solutions Cooperative (Dscoop) EMEA conference in Lyon is the biggest annual conference in Europe, the Middle East and Africa, for graphic arts business owners using HP Indigo digital printing technology and Highcon is a Gold Partner. Joris Bosch of Drukkerij Wihabo and Eran Friedman of Ilan Print, who will be joining Eshchar Ben-Shitrit, Highcon VP Marketing, at the educational session on Thursday, June 8th at 12:15, will be speaking about how “Digital finishing completes digital printing”. Both of these HP Indigo digital press users have been able to demonstrate not only the efficiency and cost-effectiveness of this new productivity boost on existing jobs, but also the opportunities it opens up to produce innovative applications that just couldn’t be done before. Through a combination of software development and mechanical upgrades, the Highcon Productivity Boost package extends the capabilities of the Highcon Euclid platform, allowing customers to produce high end decorative work, as well as regular die-cutting jobs with higher margins than ever before. The productivity boost applies to Highcon Euclid III, Euclid IIIS and the numerous Euclid machines installed around the globe. Visitors to the Highcon booth, #53, at the Dscoop conference will be able to see a wide range of samples produced on the Highcon digital finishing machines and learn how a complete digital process reduces bottlenecks and opens the door to countless new opportunities in high-value applications and markets. The preceding press release was provided by a company unaffiliated with Printing Impressions. The views expressed within do not directly reflect the thoughts or opinions of the staff of Printing Impressions.